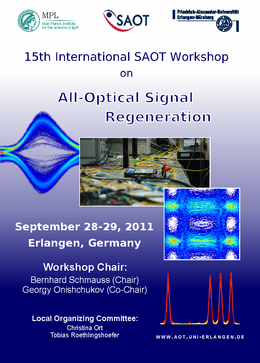 While the SAOT covers nearly the entire spectrum of optical technologies, the workshop will concentrate on functional optical imaging. About ten experts are going to teach basic concepts and present research topics in the presence of an audience of doctoral candidates with a strong background in optical technologies and biophotonics. Advanced laser systems play a major role in ranges such as material processing, metrology, medicine and communication. However, there are still a vast number of challenges that need to be solved with respect to novel laser systems that operate powerful and precisely. Simulations are required in order to shift the state of the art in laser development beyond current limitations. At the same time a profound understanding of amplification dynamics is necessary to create new concepts for advanced solid-state lasers. In detail, the present workshop includes novel simulation techniques, recent progress in crystal growth, challenges in experimental development and future tasks for simulations. Nano- and micron-sized particles are widely employed and produced in industrial, combustion and research applications. 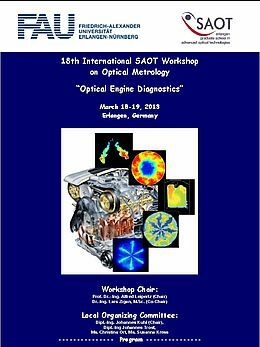 The scope of the workshop is to give an overview over modern optical particle diagnostics. 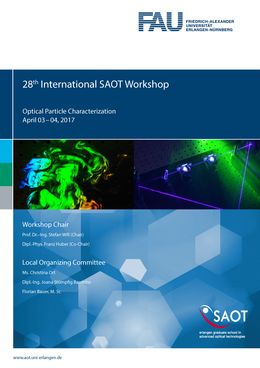 The topics of the presentations cover a wide range of particle characterization: from fundamental theory and modeling of scattering to soot particle measurement techniques and methods for particle characterization in aerosols and suspensions. Although experimental investigations of laser material processing still represent the most widely used technique to increase process understanding and to establish process models, the interest in numerical process simulations has strongly increased within the last years. Their main advantages are that in contrast to experiments, they offer access to variables that are very hard to measure or cannot be experimentally quantified at all and allow for the selective manipulation of individual process and material parameters. The goal of this workshop is to present the fundamentals and current research topics of both empiric process models and numerical process simulations of various laser material processing techniques such as laser beam welding and cutting and laser based additive manufacturing. This workshop will focus on new imaging applications and technologies in Computed Tomography (CT) reconstruction. International experts and scientists from the Pattern Recognition Lab will present their current work covering the design of new hardware, data simulation, image enhancement and phase contrast imaging. 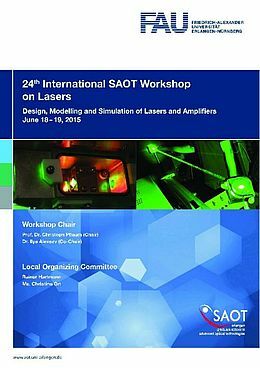 While the SAOT covers nearly the whole spectrum of optical technologies, this workshop will concentrate on material processing, in particular on laser based additive manufacturing. About twelve experts will relate fundamentals and present research topics in the presence of an audience of doctoral candidates with a strong background in optical technologies. The focus is on Laser Beam Melting of metals in powder bed and on Laser Metal Deposition. 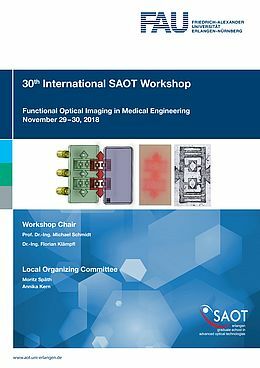 While the SAOT covers nearly the whole spectrum of optical technologies, this workshop will concentrate on design, modelling and simulation of lasers and amplifiers. About ten experts will relate fundamentals and present research topics in the presence of an audience of doctoral candidates with a strong background in laser simulation. The scope of this workshop is to give an overview over optical, non-invasive diagnostics for process technology applications. It additionally aims to connect the community of process technology with the community of optical diagnostics. The scope of the workshop is to give an overview over modern spray and engine diagnostics. The topics of the presentations cover a wide range of optical diagnostics for engine and spray investigations, applications and injection characterisation. 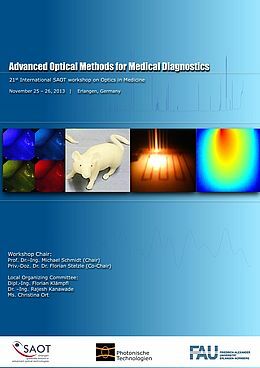 While the SAOT covers nearly the whole spectrum of optical technologies, this workshop will concentrate on medical diagnostics based on optical methods. About ten experts will relate fundamentals and present research topics in the presence of an audience of doctoral candidates with a strong background in optical technologies and biophotonics. The number of historical documents that are in digital form has dramatically increased during the last five to ten years. Consequently, there has also been a significant growth in the development of computerized tools for supporting the analysis of such documents. 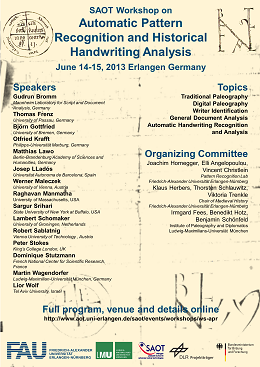 The goal of this symposium is to bring together the world’s leading experts on historical document analysis from a diverse set of fields, such as Pattern Recognition, Computer Vision, Medieval History and Auxiliary Sciences of History. 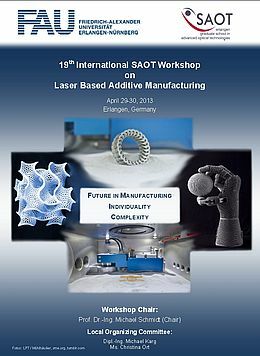 The workshop is intended to discuss research and industrial aspects of Additive Manufacturing. The focus is on fundamentals and applications of Laser Based Additive Manufacturing processes such as Laser Beam Melting in powder bed, Stereolithography and Laser Metal Deposition. The workshop aims to bring together international experts to discuss fundamental aspects, potential applications, and technological challenges in these fields. The workshop will address fundamental aspects of nonlinear optics, advanced optical techniques for the characterization of interfaces, and the characterization of nanoparticles and colloids using nonlinear optics. Prof. Boris Chichkov, Leibniz Universität Hannover und Laser Zentrum Hannover e.V. This two days workshop is intended to introduce modeling basics and theoretical framework of various numerical methods for electromagnetic field simulation such as Finite Element, Finite Difference and Finite integration method. The lectures address practical and innovative aspects of present and future simulation technology.